Ji-Xu Xiang is in pink. Two grey regions in the west of the pink are sometimes considered Ji-Xu-speaking. Ji–Xu Xiang (吉漵片), also known as Chen–Xu (辰溆片), is a cluster of Xiang dialects spoken in western Hunan that do not fit into the traditional New Xiang–Old Xiang dichotomy. They are geographically separated from the New Xiang dialects that they were traditionally grouped with. In the Language Atlas of China (1987), Xiang was divided into three subgroups. Their Ji-Xu subgroup comprised varieties spoken in the counties of Chenxi, Xupu, Luxi, Jishou, Baojing, Huayuan, Guzhang and Yuanling. Bao and Chen (2005) identified five subgroups of Xiang. Their Chen-Xu subgroup included varieties spoken in Chenxi, Xupu, Luxi, with the rest of the Atlas's Ji-Xu subgroup classified as Southwest Mandarin dialects. ↑ Hammarström, Harald; Forkel, Robert; Haspelmath, Martin; Bank, Sebastian, eds. (2016). "Jishu". Glottolog 2.7. Jena: Max Planck Institute for the Science of Human History. ↑ Wurm, Stephen Adolphe; Li, Rong; Baumann, Theo; Lee, Mei W. (1987). Language Atlas of China. Longman. ISBN 978-962-359-085-3. ↑ Bào, Hòuxīng 鮑厚星; Chén, Huī 陳暉 (2005). 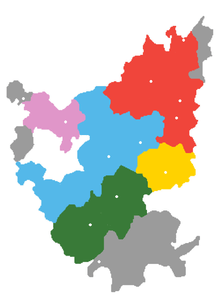 "湘語的分區 Xiāngyǔ de fēnqū" [The divisions of Xiang languages]. Fāngyán. 3: 261–270. doi:10.3969/j.issn.0257-0203.2005.03.011.